One of the greatest joys of being in the Middle East is the fantastic food. 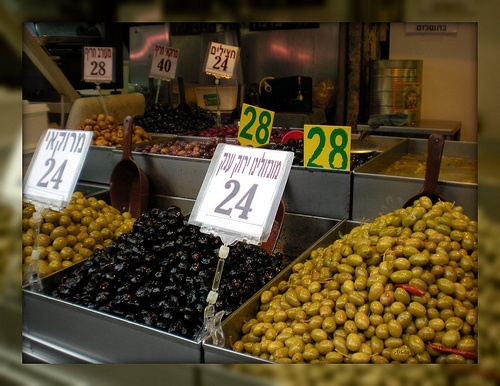 While there are supermarkets spread across Israel that could handle all of your shopping needs, it's so much more fun to go to the shuk! Another essential stop in the shuk is at Uzi Eli's stand with freshly made spreads, sauces, and drinks made from the best of herbs and other ingredients available. 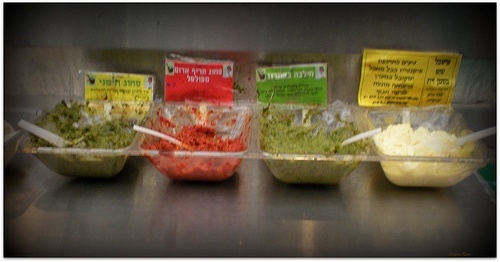 You must try their samples of the green Yemenite schug and the hilbeh. To drink, try the Rambam mix for a little sweet almond taste of health. 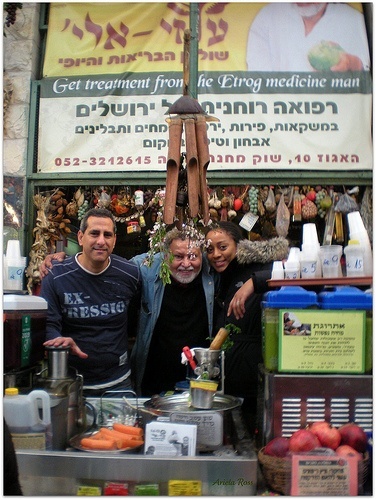 The Jerusalem etrog medicine man (above, center) and his natural, delicious salads with medicinal properties (below). Pick up some fish to grill, broil, or pan fry. You can make a delicious Moroccan or Yemenite style fish, or just throw it on the barbecue if you want to create a traditional Israeli summer meal. 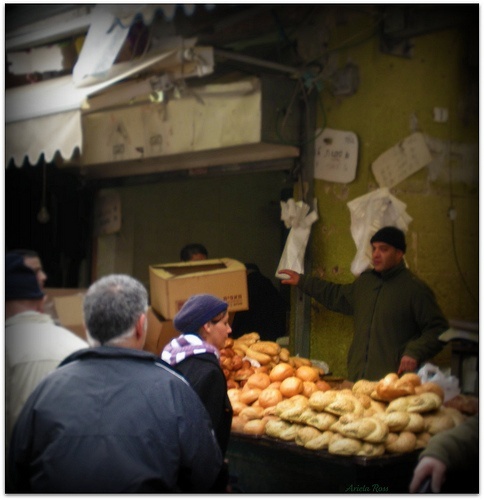 There are plenty of shops that offer one of the more famous local ingredients, olives. Choose from Moroccan Black olives, large Stuffed Green olives, and more. They will also sell various pickled vegetables on the side, such as pickled eggplant and cucumbers. 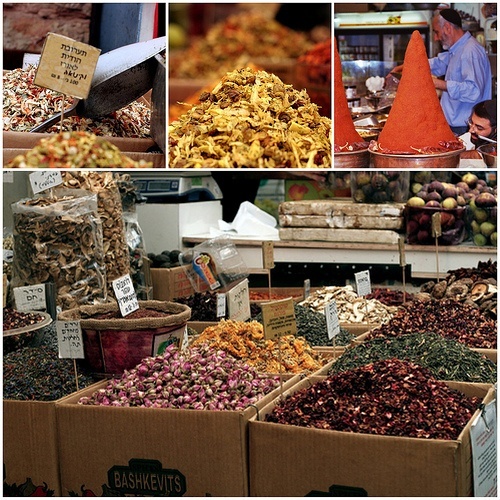 Check out the colorful spices that are the staples of any great local dish. 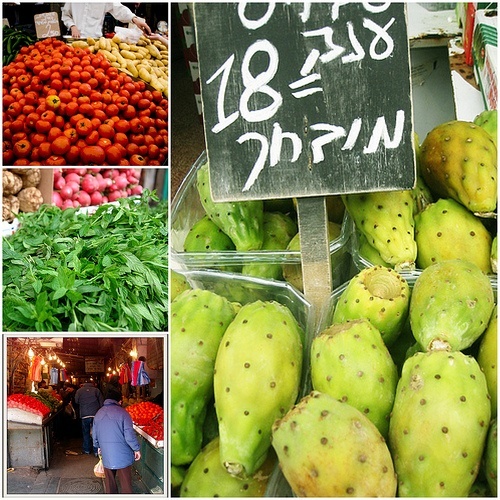 Of course, the star items at the shuk are none other than the gorgeous, local farm grown fruits and vegetables. Well, what are you waiting for? Go out and get some great deals at the Mahane Yehuda shuk. Try the following recipe for a yummy shuk-inspired refreshing lunch. Rinse all vegetables and fruit before preparation. Pat dry. Toss the first five ingredients together in a large bowl. Place the candied pecans inside of a paper bag and crush. Add the pecans and crumbled cheese into the salad mix. Add the olive oil and za'atar, to taste, and toss again. Serve and enjoy. Beteavon!